The Concussion Blog - Vestibular rehabilitation in the management of concussion, does it work? In his 5th Concussion blog, Theo farley explores if vestibular rehabilitation works in the management of concussion. Welcome back to The Concussion Blog. So far in this series we have already considered whether vestibular and oculomotor tests can be used in the diagnosis of concussion with the study we reviewed establishing two different vestibulo-oculomotor test batteries with a diagnostic accuracy of 94.4% and 98.6% (see blog one). This week we’re going to look at a systematic review by Murray and colleagues who set out to answer two questions- 1) Does vestibular rehab post concussion improve a) subjective reports of dizziness and vertigo, b) gaze stabilisation deficits, c) balance impairments d) gait impairments? and 2) Does vestibular rehab facilitate early return to sport verses controls. This, done in a safe manor is what we’re trying to achieve in the sporting environment. Murray DA, Meldrum D, Lennon O. Can vestibular rehabilitation exercises help patients with concussion? A systematic review of efficacy, prescription and progression patterns. Br J Sports Med. 2017 Mar;51(5):442 – 451. It is well established that the majority of concussions will resolve clinically in 7 – 10 days, however a sub group exists of between 10% and 30% of patients that suffer ongoing symptoms beyond this period due to vertigo, dizziness and balance dysfunction. Patients with these symptoms at the onset of concussion have been found to have a six-fold increase in risk of suffering prolonged symptoms(2). The most recent Consensus Statement on Concussion in Sport (2012, we’re still waiting for the 2016 statement) advocates consideration of vestibular pathology as part of a multi disciplinary approach, however in my experience this is an area of assessment and treatment rarely undertaken following concussion, often due to a lack of understanding on behalf of clinicians. Vestibular rehab has been described in scientific literature since at least the 1940’s by Cawthorne and Cooksey who described a set of patient led exercises that we still use in rehab today. In 2011 a Cochrane review found moderately strong evidence for the use of vestibular rehab in the treatment of unilateral peripheral vestibular dysfunction. As we have found in blog one, vestibular and oculomotor assessment is an accurate tool in the diagnosis of concussion and therefore can we assume that addressing the vestibular and oculomotor system in our treatment will be equally as effective? Murray and colleagues used PubMed, CINAHL, EMBASE, SPORTDiscus, Web of Science and PEDRO using variations of search terms ​‘concussion’ ​‘mild TBI’, ​‘closed head injury’, ​‘second impact syndrome’, ​‘head trauma’/ ​‘labyrinth’, vertigo’, ​‘dizziness’ ​‘BPPV’, ​‘convergence’/ ​‘physical therapy’, ​‘exercise’, ​‘movement’, ​‘maneuver’, ​‘Cawthorne’, ​‘Cooksey’. PRISMA guidelines and the Cochrane risk of bias tool were used to ensure reporting standard and risk of bias respectively. Of 3355 search results ten articles met the inclusion criteria: two RCT’s (one was abstract only), two prospective cohort studies, one retrospective study and five case studies. In 8⁄10 studies the population was taken from a sporting or military background. Results were analysed based on the five headings mentioned above. For the sake of efficiency I will focus predominantly on the RCT’s, prospective cohort studies and retrospective studies. 9⁄10 studies incorporated gaze stabilisation in to their treatment programme with two looking at dynamic visual acuity. This test looks at the subjects’ ability to read the lines of an eye assessment chart while moving their head. Improvement is noted post treatment if the subject can read further down the chart during head movement. 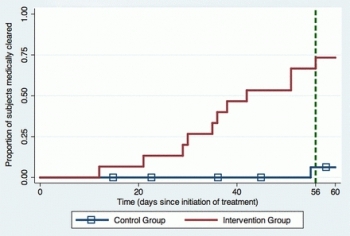 An average of a 2.25 line improvement was noted in the intervention group with a 1.5 line improvement seen in the control group. This is significant as an athletes ability to fix on target while moving is essential for all sports- picking out a pass while running, chasing a return of serve or judging the height of a jump from a moving horse- the list goes on. 9⁄10 studies used a pre and post intervention balance assessment. The fully published RCT reported that 64% of the medically cleared treatment group reached 100/100 on the Activities-specific Balance Confidence scale compared with 25% of the control group who were not medically cleared. The retrospective chart review and prospective cohort study also reported significant improvements in balance measures post intervention (p=0.534, p≤0.01 respectively). 6⁄10 studies reported gait impairment analysis. In the retrospective chart review of 114 patients reported a Functional Gait Assessment mean improvement of 6 points (p<0.001), a Timed Up and Go mean improvement of 1.9 m/​s (p<0.001) and a Dynamic Gait Index mean change of 3 points (p<0.001) following treatment. Obviously there is no control group for comparison in this study but a mixed-factor repeated-measures analysis of variance was used to test whether there was an effect of vestibular rehabilitation therapy on the outcome measures. Other reported results for this measure included the case studies that reported favorable results. Five of the studies reported this outcome measure with one RCT reporting subjects that completed the study intervention were 10.27 (3.91 after intention to treat) times more likely to return to sport within 8 weeks than those in the control group. This is a significant advocate for the inclusion or at least the assessment of the vestibular and oculomotor system in sporting concussion! One cohort study and the case studies reported strong results for return to sport/​work following vestibular rehab, again with no control. One case study reported no return to work within the study period however this was a military blast patient. The frequency and intensity of intervention sessions varied vastly between studies from once a week to six one hour sessions over three week with six studies prescribing a daily home exercise programme. The study by Schneider who reported the impressive results on return to sport used 8 weekly sessions involving an individualised programme of habituation, gaze stabilisation, adaptation exercises, standing balance exercises, dynamic balance exercises and canalith repositioning maneuvers. These subjects also received cervical manual therapy and neuromuscular retraining. It’s difficult to draw firm conclusions from this review based on the mixed quality of studies involved. What it does suggest consistently through the review is that it is likely that vestibular and oculomotor treatment on appropriate patients will improve balance, gait, perception of dizziness and ultimately and most importantly in the sporting environment a safe and timely return to play. We know that the risk of concussion is high in athletes who have already suffered one or more concussions(1) and we also know that the risk of suffering a musculoskeletal injury following return from concussion is also much higher(3). Both of these factors strongly suggest to me that given the lack of this type of intervention that we should be doing more active rehab rather than just waiting for athletes symptoms to resolve. We wouldn’t just wait for pain to go before considering return to play following an ankle injury so why is concussion any different? To book an appointment with Theo follow the link or call our Kensington clinic. Guskiewicz KM, Mccrea M, Marshall SW, et al. Cumulative effects associated with recurrent concussion in collegiate football players: the NCAA Concussion Study. JAMA. 2003;290(19):2549 – 55. Lau BC, Kontos AP, Collins MW, Mucha A, Lovell MR. Which on-field signs/​symptoms predict protracted recovery from sport-related concussion among high school football players? Am J Sports Med. 2011 Nov;39(11):2311 – 8. Lynall RC1, Mauntel TC, Padua DA, Mihalik JP. Acute Lower Extremity Injury Rates Increase after Concussion in College Athletes. Med Sci Sports Exerc. 2015 Dec;47(12):2487 – 92. Schneider KJ, Meeuwisse WH, Nettel-Aguirre A, Barlow K, Boyd L, Kang J6, Emery CA. Cervicovestibular rehabilitation in sport-related concussion: a randomised controlled trial. Br J Sports Med. 2014 Sep;48(17):1294 – 8.